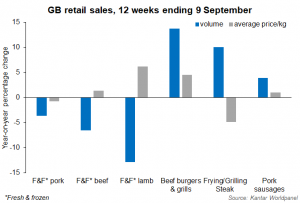 During the 12 weeks ending September 9, meat retail sales declined, according to data from Kantar Worldpanel. 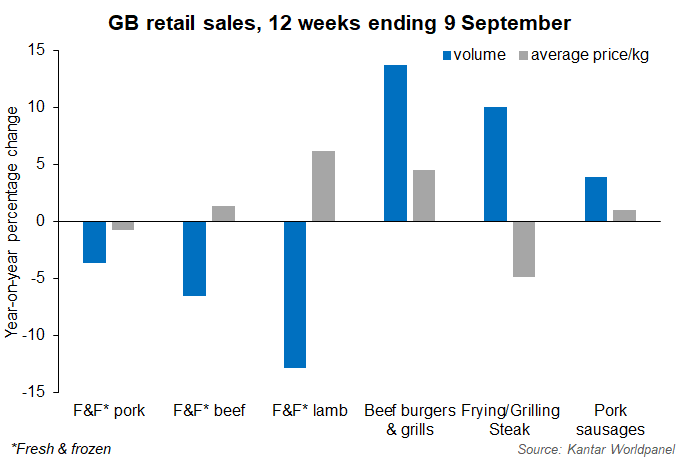 The only increase in retail volume sales was seen in pig meat, which was up a modest 0.4%. Primary meat in particular is feeling the strain, despite the afterglow of summer sustaining volume sales of the other categories. Spend in the other categories looks to have been driven by a desire for quick and convenient foods, consumed at barbeques and picnics. In concert with the increased number of barbeques and picnics, sales of BBQ pork items were promising. The volume of pork ribs sold was up 8%, and marinades up 19%. Pork sausage sales volumes also increased; up 4% on the year. Contrary to this, volume sales of loin roasting joints were down a huge 44% as the average price per kg increased by 27%. This reduction in sales drove the overall 4% year-on-year decline in volume of fresh & frozen pork sold. Furthermore, burger sales have remained high with volume sales up 14% on the year and the value of the market increasing by 19%. Market penetration for burgers also increased by almost 7%. Burgers saw another boost from National Burger Day (on August 23) with the surrounding press and promotion. The volume of frying/grilling steaks and marinades retail sales were also increased; up 10% and 35% respectively. Beef, overall, has had a strong decline in volume sales (-6.5%), driven by a sharp 28% decline in roasting joints and 7% decline in mince.